Cumbria’s stunning landscape has influenced countless writers and poets; it is accessible and mostly unchanged. The footpaths of the Lake District National Park reveal idealistic scenery familiar to the numerous essayists, authors and poets who have been inspired by the area. The Lake Poets William Wordsworth, Samuel Taylor Coleridge and Robert Southey were aroused by the mountains and lakes. 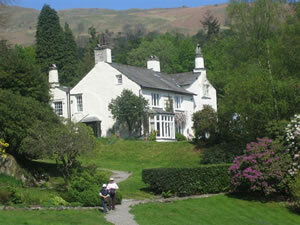 Social Reformer John Ruskin resided, for the last 30 years of his life, at Brantwood on Conistonwater. Alfred Lord Tennyson was on honeymoon at Mirehouse, on the shores of Basenthwaite Lake, when he drafted the epic poem Morte d’Arthur. Beatrix Potter and Arthur Ransome based their children’s stories in the region. Discover the energy, loves and relationships of illustrious writers, the Romantic Poets and legendary social commentators. Participate in moderate walks and interesting visits. Listen to poetry and fascinating anecdotes. Share in casual discussion. Achieve a relationship with nature that will “impregnate and elevate the mind”.